Maritzburg United will be looking to follow on from their victory in the Telkom Knockout when they meet Chippa United in an Absa Premiership match on Wednesday evening. The game takes place at the Harry Gwala Stadium with kick off set for 19H30. 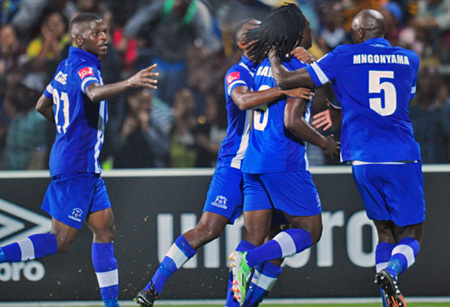 Maritzburg are searching for their first league win of the season and will be positive about getting the win after showing signs of invigoration under new coach Clive Barker. While the Team of Choice are propping up the standings, Chippa head in to the game in ninth position, although the PE side are yet to pick up any points on the road this season. Maritzburg enjoy a superior record over the Chilli Boys, with three wins and a draw in their four previous league encounters. The KZN side have won both their two previous home encounters against Chippa, scoring five goals in the process. Maritzburg have won both of their two previous home matches against Chippa, scoring five unanswered goals in the process. Last season United won 3-0 in at home before drawing 1-1 in the return game. In team news, the hosts will be without Thami Mkhize, who sits out the game with a suspension. Maritzburg’s line-up from their 4-1 loss to Aces in their last league game Vries, Zulu, Mkhize, Pantsil, Booysen, Lentjies, Hartog, Onyango, Shandu, Mekoa (Mokate 55’ [Banda 61’]), Anas (Sherman 66’). Chippa’s line-up from their 2-1 win over Polokwane: Akpeyi, Okwuosa, Thopola (Macheke 41’), Maleasenya, Chipeta, Sangweni, Bance, Manzini (Cele 52’), Mthiyane (Twala 73’), Mayambela, Sali.